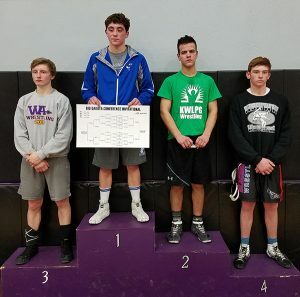 Woonsocket eighth grader Camden Jost, far right, earned fourth place at the Big Dakota Conference wrestling tournament held in Ft. Pierre last Saturday. On Saturday, Feb. 2, the Wessington Springs/Woonsocket/Wolsey-Wessington wrestling squad competed in the Big Dakota Conference Tournament in Ft. Pierre. This was a huge tournament with 23 teams and tough competition. Many of the top-rated wrestlers in the state took part in this tournament. They only placed four wrestlers in each weight class, so anyone who placed at this tournament should have a good showing for the season. The wrestlers saw their next competition on Tuesday, Feb. 5, at a triangular in Miller. Results for that will be in next week’s issue. Their next tournament takes place close to home in Huron on Saturday, Feb. 9, starting at 10 a.m.
…Read the placings of the Big Dakota Conference in this week’s issue of the Sanborn Weekly Journal.